A sweeping epic by Nobel Prize-winner Ivo Andrić about power, identity, and Islam set in 19th-century Ottoman Bosnia and Istanbul. 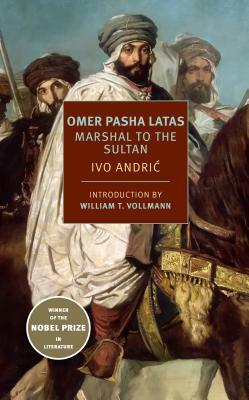 Omer Pasha Latas is set in nineteenth-century Sarajevo, where Muslims and Christians live in uneasy proximity while entertaining a common resentment of faraway Ottoman rule. Omer is the seraskier, commander in chief of the Sultan’s armies, and as the book begins he arrives from Istanbul, dispatched to bring Sarajevo’s landowners to heel, a task that he accomplishes with his usual ferocity and efficiency. And yet the seraskier’s expedition to Bosnia is a time of reckoning for him as well: he was born in the Balkans, a Serb and a subject of the Austro-Hungarian Empire, a bright boy who escaped his father’s financial disgrace by running away and converting to Islam. Now, at the height of his power, he heads an army of misfits, adventurers, and outcasts from across Europe and Asia, and yet wherever he goes he remains a stranger. Ivo Andrić, who won the Nobel Prize in 1961, is a spellbinding storyteller and a magnificent stylist, and here, in his final novel, he surrounds his enigmatic central figure with many vivid and fascinating minor characters, lost souls and hopeless dreamers all, in a world that is slowly sliding towards disaster. Omer Pasha Latas combines the leisurely melancholy of Joseph Roth’s The Radetzky March with the stark fatalism of an old ballad. Ivo Andrić (1892–1975) was born to Catholic Croatian parents in a village in Austrian-occupied Bosnia. His father died when he was two, and his mother sent him to live with his aunt and uncle in Višegrad, a town on the Drina River near the Serbian border. In high school, he began writing poetry and joined Young Bosnia, a student revolutionary movement advocating South Slav unification. Andrić enrolled at the University of Zagreb in 1912, where he continued working with South Slav nationalist groups, then transferred to the University of Vienna, and later to the University of Kraków, all the while publishing poems in Bosnian journals and anthologies. Upon the assassination of Archduke Franz Ferdinand in 1914, Andrić, an associate of Gavrilo Princip, returned to Bosnia and was quickly arrested by Austrian police. Over the course of World War I, while in prison and later under house arrest, he wrote a number of prose poems that were published in two collections after the war, Ex Ponto (1918) and Nemiri (Unrest, 1920). In 1919, Andrić was appointed to the Ministry of Foreign Affairs in the new Yugoslavian government, and served as a diplomat in the Vatican, Bucharest, Trieste, Paris, Madrid, and, finally, as the ambassador to Germany, a post he held at the outbreak of World War II. Refusing the German government’s offer of safe passage to Switzerland, he returned to Belgrade, where he spent the war under house arrest, writing his two best-known novels, Na Drini ćuprija (The Bridge on the Drina) and Travnička hronika (Bosnian Chronicle), which were published in 1945. The Bridge on the Drina would go on to become required reading in Yugoslavian high schools, and Andrić would become a celebrity in Communist Yugoslavia. He was named the president of the Yugoslavian Writer’s Union and in 1950 was appointed a deputy in the National Assembly of Yugoslavia. In 1958, he married Milica Babić, a costume designer twenty years his junior, and in 1961 he was awarded the Nobel Prize in Literature. Babić died in 1968, and Andrić lived alone in an apartment in Belgrade until his death in 1975. His funeral was attended by ten thousand people, and his former apartment was converted into a museum. Celia Hawkesworth has translated nearly forty books from the Serbo-Croatian, including Bosnian Chronicle by Ivo Andrić; The Museum of Unconditional Surrender by Dubravka Ugrešić; Belladonna by Daša Drndić, which was short-listed for the Oxford Weidenfeld prize in 2018; and Adios, Cowboy by Olja Savičević. William T. Vollmann is the author of three collections of stories, more than ten novels, and many more volumes of nonfiction. His novel Europe Central won the National Book Award in 2005, and he has won the Whiting Foundation Award and the Shiva Naipaul Memorial Award for his fiction. In 2018, he published a two-volume investigation into climate change, Carbon Ideologies.